Our Walsingham Christmas Brochure 2018 is available to inspire you for the Christmas season. Our brochure highlights some of the scrumptious Norfolk food on offer from Walsingham this Christmas. As well as details of our opening hours, and the exciting range of delicious food we have on offer, this year we are taking orders instore at either our butchery counter or our deli counter. Your entire order including fruit and vegetables can be made in one place so no need to make multiple orders. Alternatively, you can place your order using the form below. 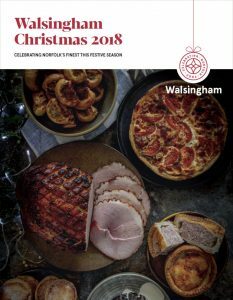 So have a look at the Walsingham Christmas Brochure, fill in your contact and delivery details, and send us your list of seasonal food that you would like to order. We will get it all ready so you can collect it on your chosen day, or we can arrange overnight Nationwide delivery. While it is too late to place an order online for delivery before Christmas, you can still come pop into one of our farm shops. All deliveries placed using our form will be made on 21st December 2018. Postage and packaging costs for delivered orders are £15 per 20 kg consignment + £1 per kilo for anything larger. A reminder to customers choosing to get their Christmas order delivered by 24hr courier, a signature is required upon delivery or alternative instructions for the courier are to be given in the event of the customer not being present on the day of delivery. Your food order will be returned to depot and re-delivered on 24th December which may result in the food spoiling. Christmas orders can be collected from our shops on 21st, 22nd, 23rd December, or on the morning of 24th December 2018.